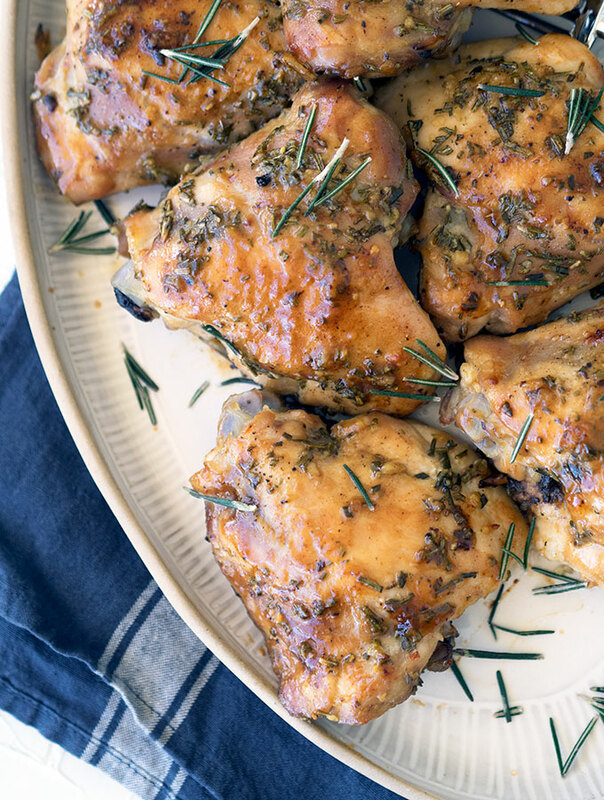 Oven baked skinless chicken thigh cutlets with maple, garlic and rosemary. 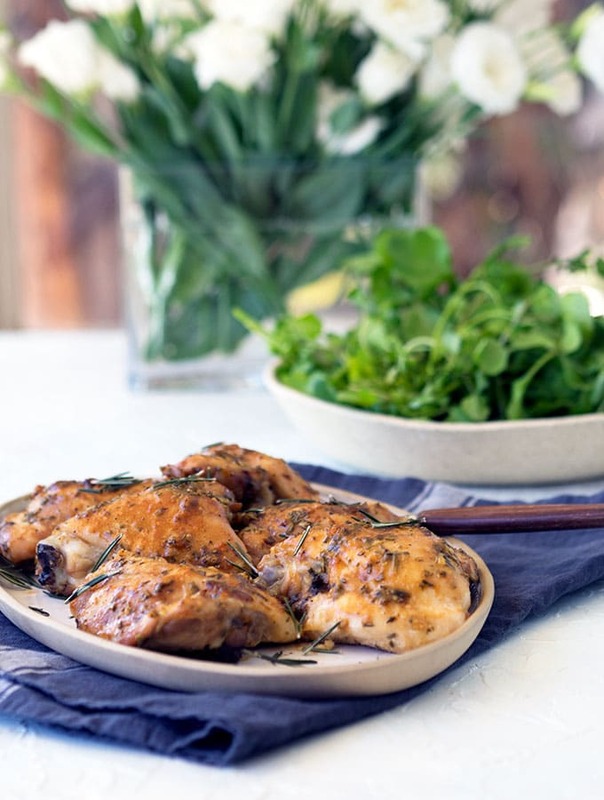 This recipe takes 5 minutes to prepare, then into the oven, for an easy, tasty mid week meal. During the week I don’t mind a meal which takes a little time to cook, as long as the preparation is super quick and easy. This means while my dinner is baking away unattended I can get on and do other things. I used skinless chicken thigh cutlets for this recipe. If you aren’t sure what a chicken thigh cutlet is, it is the thigh part of the chicken without the leg, bone still in. Basically, a chicken thigh fillet with the bone. You don’t have to use skinless chicken thigh cutlets. This recipe gives you room to move. It’s easy to swap out the cutlets for thigh fillets. You could even use thigh cutlets or fillets with the skin still on. Or even use chicken breast, but be warned chicken breast does tend to dry out a little in the oven. My chicken thigh cutlets were purchased with skin, which is usually how I find them. Trying to choose healthier options I removed the skin. This took me a less than two minutes, but if you aren’t as skilled at removing the skin from chicken (aka lots of years practice) then it may take you a little longer. You can always ask your butcher or poultry shop to remove the skin for you. 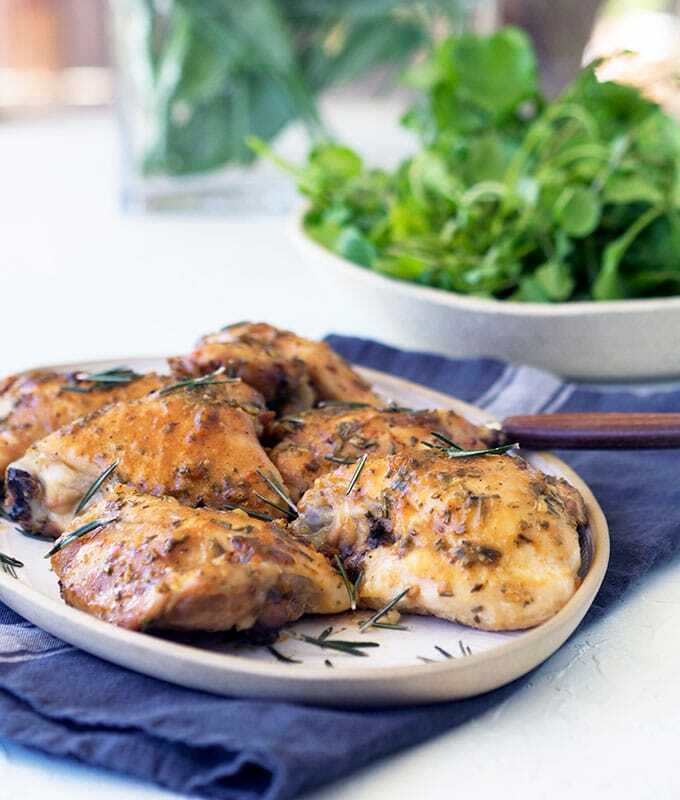 Once you have your skinless chicken thigh fillets, it is a matter of a couple of minutes before they are cooking in the oven. All you need to do is crush some garlic, chop fresh rosemary, measure out the maple syrup and Dijon mustard. Mix those four ingredients in a bowl, spread over your chicken, and bake. This really is such a simple recipe. Dinner will be in the oven for approximately 45 minutes. Then it is a case of serving with a simple garden salad. Alternatively, you could place some vegetables in the oven to bake along with your chicken. Be sure to baste them with cooking juices as the bake. This will result in a finger licking sticky maple, garlic and rosemary coating when they are done. If you use chicken thigh fillets (no bone) they will take less time to cook in the oven. Depending on the thickness of your fillets, probably around 30 minutes baking time. What is the benefit of using skinless chicken thigh cutlets over skinless chicken thigh fillets? The taste of course! Meat cooked on the bone will always be more flavourful than meat cooked off the bone. It’s as simple as that. Pre-heat oven 180 deg C (360 deg F). Line a shallow baking tray with baking paper (this makes it easier to clean up afterwards). Place skinless chicken thigh cutlets, bone side down, on the prepared baking tray. In a small bowl place maple syrup, garlic, mustard and rosemary. Mix ingredients well. Spread maple syrup mixture over the top of the thigh cutlets. Make sure to coat them well. Place in the oven for 45 minutes or until golden and cooked through. For best results baste thigh cutlets while cooking. Test to ensure they are cooked through by inserting a skewer into the thigh, if juices run clear, it is cooked. Serve with oven baked vegetables or fresh garden salad. Prick the skin of the chicken with a skewer before placing in the oven to bake. This will allow the fat underneath the skin to be released and ensure nice crisp brown chicken skin. « Touch of Lux – Deluxe Suite Peninsula Hotel Bangkok! This recipe is simply amazing !!!!! We loved every mouthful ? Thigh cutlets are a big part of our dinner diet here. Oh, and lunch. Will be splashing in a bit of maple next time it’s time to marinade more, which may be tomorrow! These looks fabulous! I’m all about hands free dinners and looking for kid friendly ideas – these fit the bill! that chicken looks and sounds delicious! Oh so yummy! What a delicious dinner! Thighs are the best! These look heavenly!